Cook pasta according to package directions. Add cauliflower and broccoli during the last minute of cooking. Drain. Rinse with cold water and drain well. 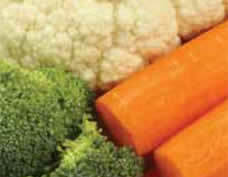 In a large mixing bowl, combine pasta with broccoli, cauliflower, carrots and green onions. Add Italian dressing and toss to coat. Cover and let chill for at least 2 hours or overnight.